Believe it or not, your hands did not evolve just so you could interact with your favorite touchscreen device. Our manual dexterity also didn’t arise thanks to more tactile activities, like pouring a drink, threading a needle or writing one’s name. However, the tools involved in these activities did depend on our relatively sophisticated hands, which is part of why anthropologists are so keen to figure out how they got started. Like many special abilities of homo sapiens, we might not have an exclusive claim on nimble digits, which has allowed scientists to look into how chimpanzees are making use of their fingers for clues. A study from Dartmouth College looked at a variety of primates to see what advantage sophisticated hands might offer. Building tools is great, and we’re fairly sure that good hands are what made tool creation possible, but that doesn’t mean that making tools was the original evolutionary pressure for our manual dexterity. So the researchers were looking to modern primates for uses of their sophisticated hands, hoping that they’d still demonstrate some of the their uses long before we decided that phalanges were best used to poke and swipe pieces of glass and plastic. The task the researchers focused on was picking figs. Ripe fruit from Ficus sansibarica are hard to spot from looks alone, and one tree might have multiple batches of fruit growing, meaning every possible snack needs to be checked out before it’s eaten. Many primates, from red colobus monkeys to chimpanzees, then have to poke and feel a fig to gauge how delicious it’s likely to be, although colobus monkeys, lacking opposable thumbs, are forced to prod with their teeth instead. This means that they not only likely end up with unripe fruit flavor in their mouths, but they’re stuck with a slower process to evaluate their food. 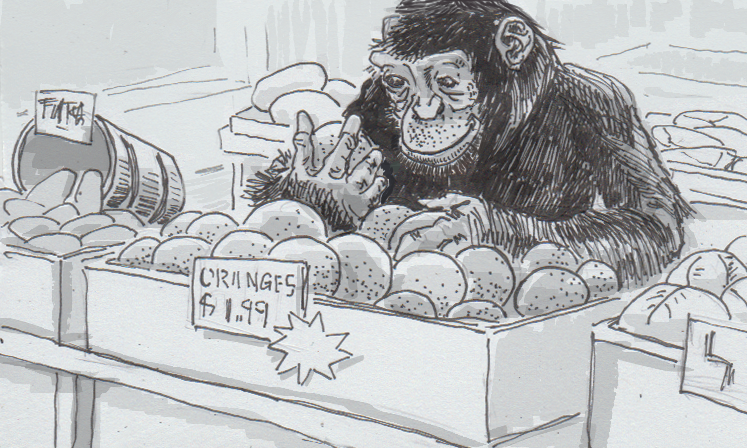 In contrast to the monkeys, chimpanzees were observed giving figs a gentle squeeze, just as you’d do in the produce section of your grocery store. The key to this was efficiency. Sorting figs with sensitive fingers and thumbs was a much faster process than monkeys could hope for with their faces. The chimps were quite adept with this method, which offers a model for how sensitive, nimble hands might have first developed, as they may have enabled our dexterous shared ancestors to select better food faster than clumsy, fruit-smashing grips, which might have already been sufficient for moving through trees or brush otherwise.